Medieval Europe was a violent place. 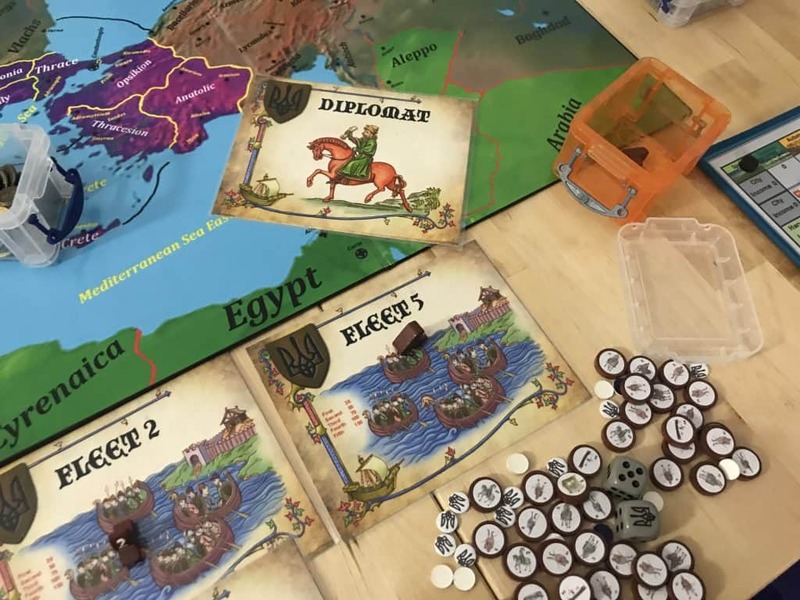 Kingdoms, empires, and religious territories battled for land, supremacy, and the hearts and minds of the continent, and Swords & Sails does its very best to reflect what that looked and felt like. 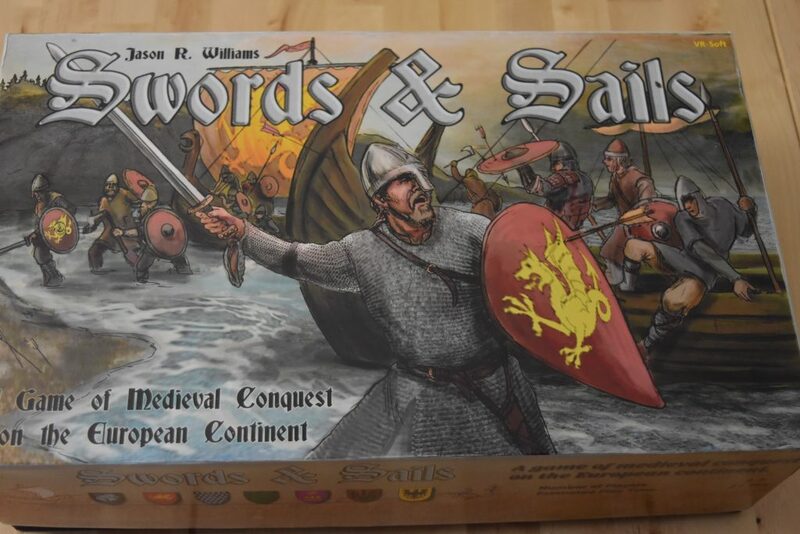 When I first opened Swords & Sails I was blown away by just how much stuff is in this box. 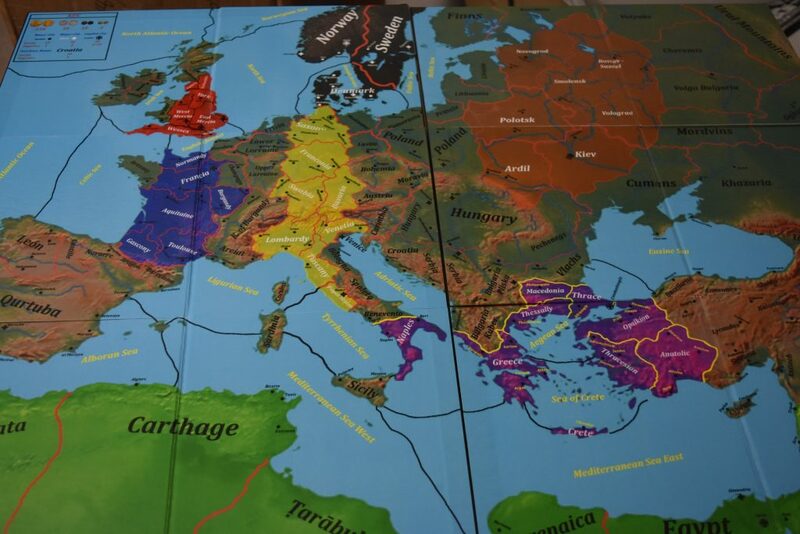 I’m a euro gamer, but I am not quite old enough to have enjoyed the golden age of dudes on a map in the 1980s. So the epic armies, boxes of bits, and massive maps overflowing from cardboard boxes doesn’t have the same nostalgic pull for me, but it’s still mighty impressive to behold. And make no mistake, Swords & Sails is a massive box of bits. But, it’s not quite a dudes on a map game. 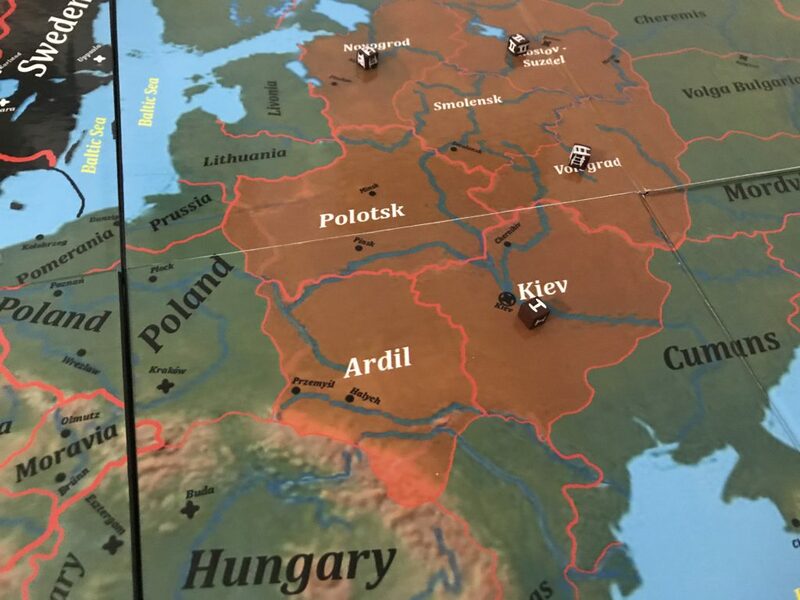 It’s a bit more streamlined, a bit shorter, and a bit more accessible, despite initial impressions, than Axis & Allies or Fortress America – my only points of reference for this type of game. 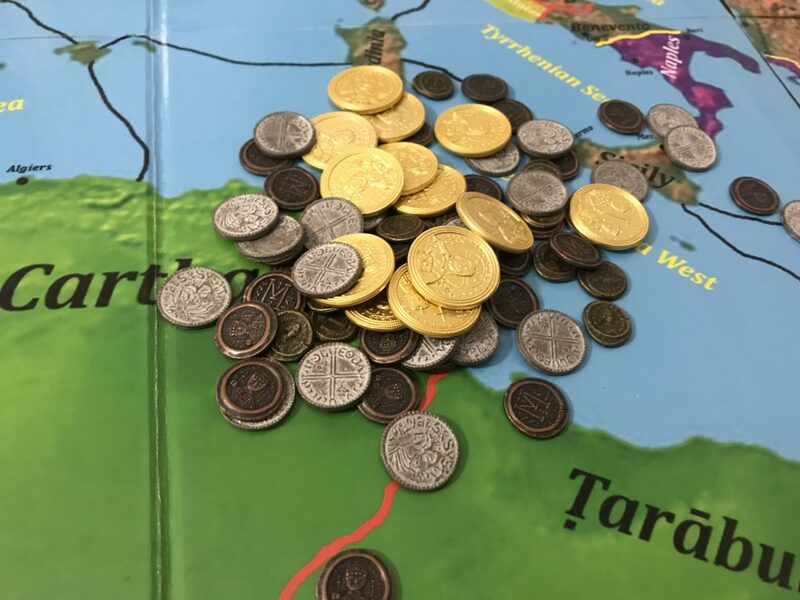 So it was with trepidation, curiosity, and a bit of gamer glee that I dug into the game, dissecting this epic game of historical kingdoms battling for the soil of 11th century Europe. 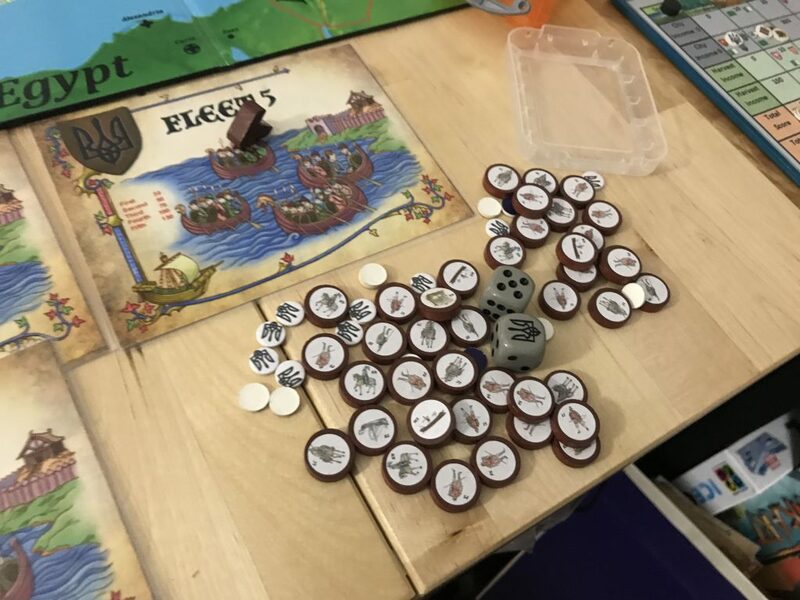 Swords & Sails is a game for 2-7 players, mostly about war and diplomacy, in which players negotiate, backstab, and roll buckets of dice to play out epic bouts of combat for territory. It’s a classic dudes on a map game with a few modern tweaks to streamline the bits and pieces that can drag on the longest, and it has a unique, old-school feel because of it. Don’t let that scare you away, though. 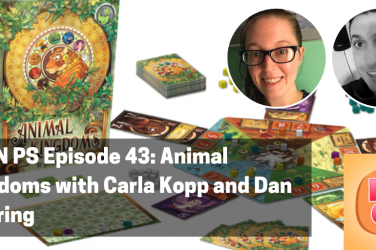 The rules are straightforward, accessible, and thematic, and the game goes out of its way to scale effectively for lower player counts, ensuring no overly open, or imbalanced games. 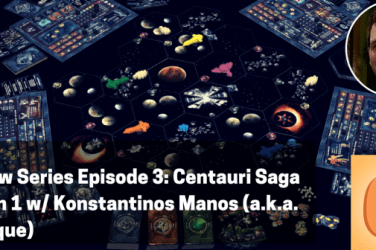 The game takes place over 9 phases – which I’ll break down quickly to outline the process of building up and pitting your armies against others. Both city and harvest income are tracked on the central score board. 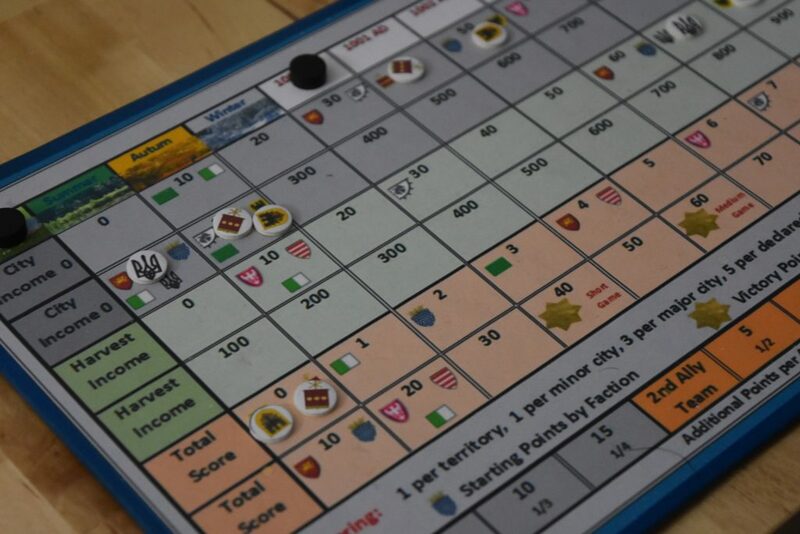 Each player will have multiple bits on this board to track their income and victory points as they change. You’ll collect intrigue cards here and save them for future use. These are going to make things a bit different for each player, further enhancing the asymmetry of the system. And it’s time for some backstabbery (and alliances, but come one, that’s not why we’re here). 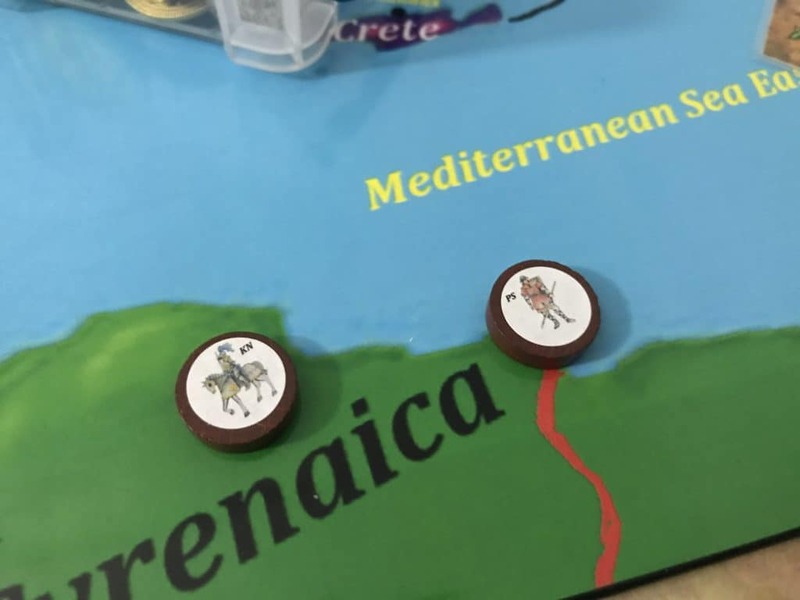 During diplomacy, players will coordinate and negotiate to determine troop movement, army composition, and next actions. 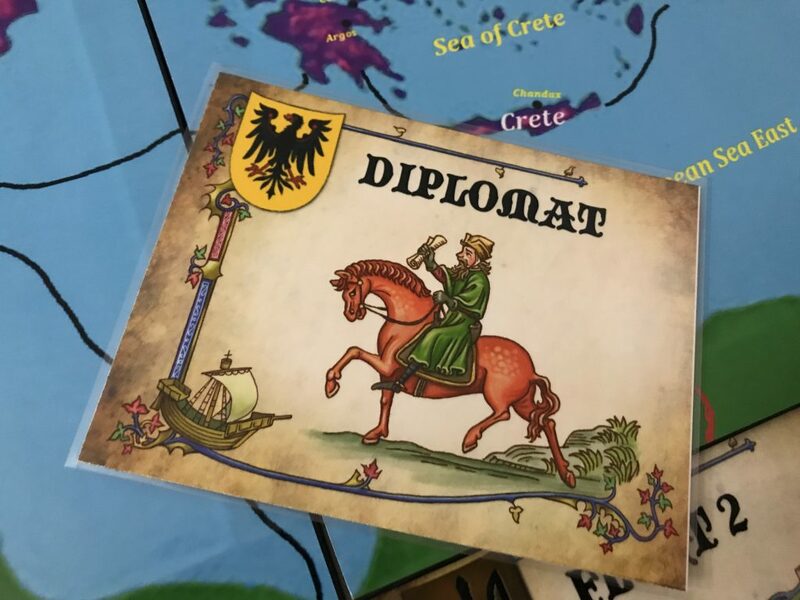 Players can use the back of their Diplomat cards to pass hidden messages around the table, or you can go to another room to chat. There are few rules for this phase other than that it is finite – once done, you can’t have these conversations again until the next round. There is a sand timer in the box as well if you need to speed up the conversations. On the back of each of your army and fleet cards that are represented on the map, you’ll write orders. This involves checking off the actions they will take, and then writing down exactly what they are going to do. Moving your Third Army? Then you need to say where they are going, and no, you cannot change this once you see what other players are doing. Now the action starts. This is when you start loading up armies onto your fleets, moving them across the board, unloading, and then moving landlocked troops. This only applies to the armies you ordered to move on the cards. Be careful not to do anything else! It’s time to roll some dice! Combat is one of the longest phases, even with the shorter rules. Whenever two non-allied Armies enter into the same territory, then at least one round of battle will occur. 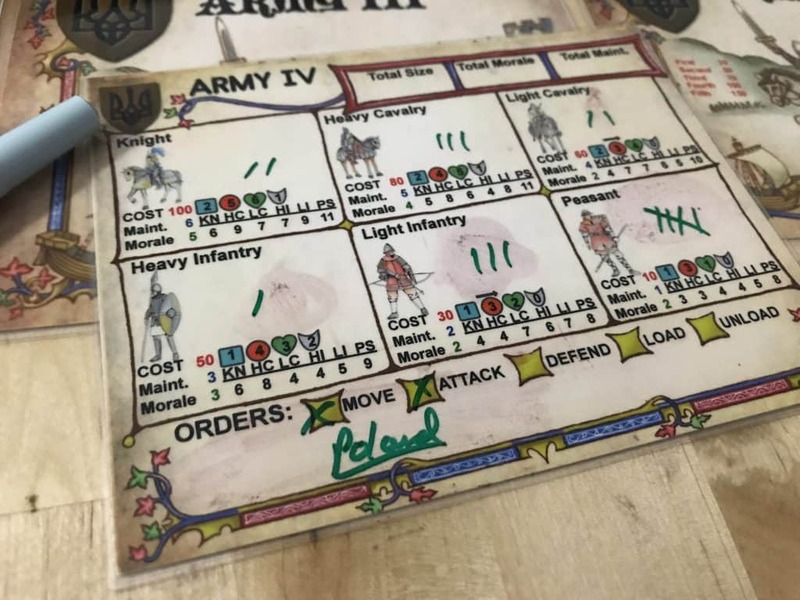 During combat, you will total armor values on the back of your army card, based on the number of units in that army of each type. You’ll then roll dice based on the number of blue dice indicated for those units – by mid-late game, this could be a TON of dice. It’s a bit of a dice fest. You will then apply damage based on your rolls, taking out units one at a time. These are pricey units, so the cost of going to battle is always high. The really interesting thing here is that you never really know how many units your opponent has (unless you previously used Espionage successfully during the Intrigue Phase). When players purchase units and upgrade armies, it’s all done in secret, so an army might be massive or it might by tiny depending on where those resources are being spent. The only real way to know is to commit to intrigue or use diplomacy to engage with those other players. Speaking of new units, it’s time to buy stuff! Unit costs are listed on your army cards and can be purchased from the income you generated at the beginning of your turn. Again, this is expensive stuff. So a lot of the game will be spent amassing troops and building up for these fights. You can both upgrade and modify cities, or build new ones in the different locations where you have control. Make sure to adjust your VPs based on the territories you control and the cities you have out. And it’s time to move on to the next phase. This is where you move your season marker forward and check for other conditions – including summer agricultural income, movement of the tracker to the next year, etc. The game can end in one of several ways – the first is by victory points. Games can be set for 40, 60 or 100 victory points for a short, medium, or long game. Another way is if the game rounds run out. There is no “conquer everyone” condition like in a classic wargame. It’s more about total victory points when the end game is triggered – which certainly helps to keep the game length manageable. 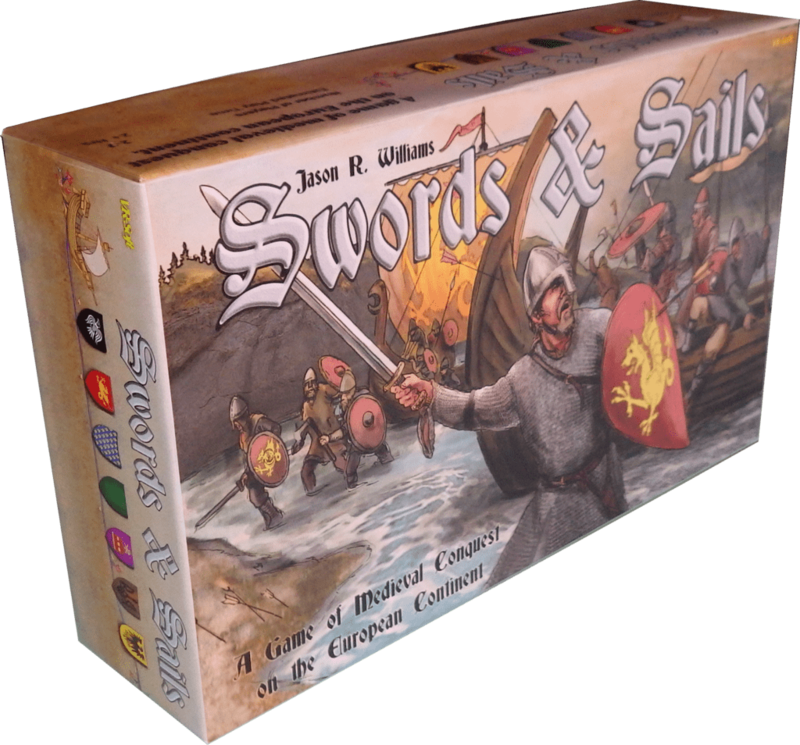 There aren’t a lot of games on the market today like Swords & Sails. 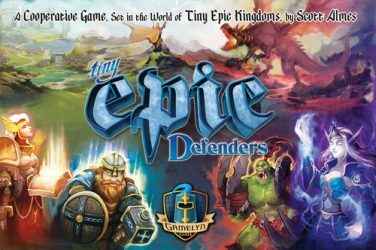 The average board game streamlines gameplay to just a few short rounds and less than two hours, with miniatures stomping across a much smaller map, often driven by cards and limited action points. I love those games. 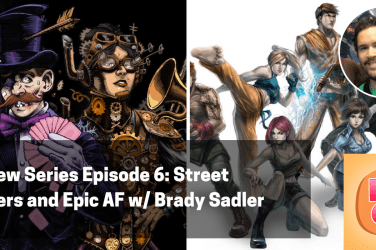 So much so that I started a podcast and a website to talk about them. But there’s something indescribable and alluring about Swords & Sails and its dice chucking, whiteboard writing, under the table negotiating mechanics. It feels raw, but at the same time refined – a modern take on a system that the gaming hobby left behind a long time ago. And that’s probably what works best in a game like this – the flexibility of the ruleset, and the ability to see what didn’t really work about those older games and modernize it for today. 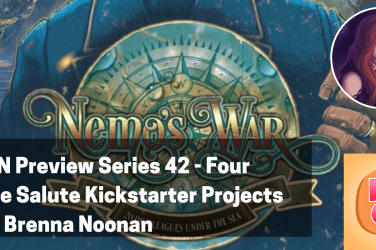 The fast combat rules, streamlined victory point system, and ability to shore up the maps and shrink things down to match for fewer than 7 players – these are all well thought out and work seamlessly in each play. 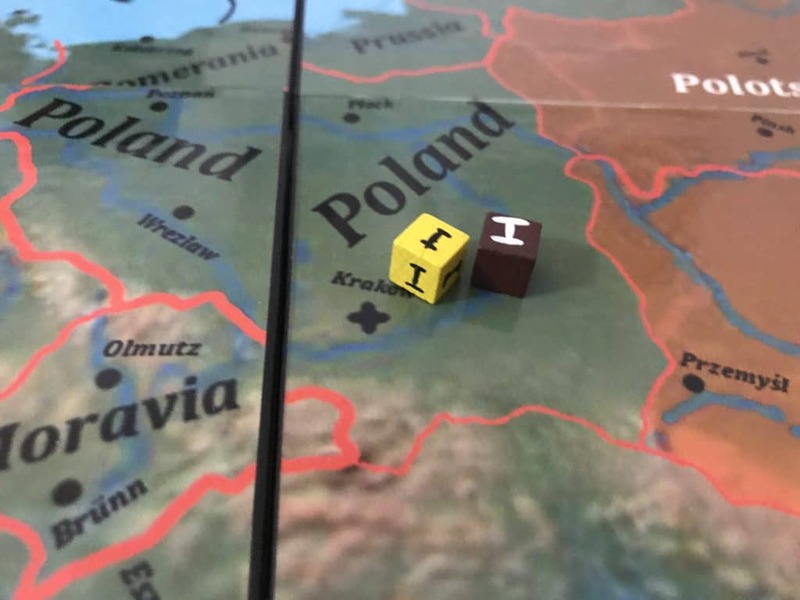 There are stories in the plays of this game – historical, sure, but also personal as you make alliances and break them, stabbing your buddy in the back to snag Poland before Jim can get there. It’s not as mean as something like Diplomacy, but it can have as strong of an impact in terms of leaving a lasting mark for the players. You’ll remember playing this for a while into the future. I had a chance to play this game with the full player count only once (in addition to some play at lower counts), and while it was the best way to play, it scaled nicely. Finally, I can’t move on without mentioning the fantastic metal coins. These are probably the best component in the box, and they are mighty fine. Modeled after classic European currency, these both look and feel amazing. They are a fantastic part of the experience – it feels amazing to clink these things together as you eyeball someone across the open battlefields of central Europe. This is a big game. Not just in terms of physical size, but in its requirements from the players. You need a lot of tablespace to effectively play this, and even more if you want to lay out your army cards and have space to see everything in front of you. The game’s bits are plentiful, and if you opt to play with full combat rules, they will be everywhere. 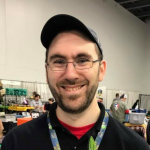 That kind of space commitment is a huge burden for both teaching and tabling the game. At the same time, because the game relies so heavily on things like diplomacy and negotiation, there are several areas with nebulous rules. It’s designed this way – intentionally left open for players to determine how and when to break the rules – but it can be frustrating at times. You’re constantly attempting to wrap your mind around what you can and should be doing, and in many cases, it’s not dictated by the rules. Lie all you want – it’s part of the game. Finally, there’s the setup process. If you play with the full seven players, this is simple. You give everyone their bits, set out the armies based on starting location and get started. 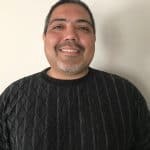 If you play with fewer, however, there are a lot of changes you’ll need to make, and there is a list of which factions can play in those games. Again, it’s not a huge problem, but it can extend setup and slow things down as you work through the setup procedures. A lot of old school gamers and wargamers are going to read the negatives above and laugh. Of course, that’s what this game is. What else would it be? And I don’t disagree. 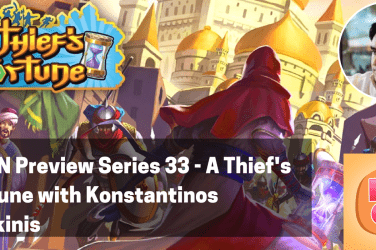 This game sets out to be a historically-rich, old school style game with dudes on a map that borrows from modern mechanisms to streamline and improve the experience – bringing it down from 12 hours to a manageable 2-3. I applaud that effort and think this is the kind of game that, if I were gaming at a younger age or if I had been born a bit earlier, I would have eaten up on a Sunday afternoon with my friends. As it is, it’s one I’m glad to have experienced and would recommend anyone with an appetite for this genre gives a shot. Check out the game currently on Kickstarter. The campaign ends on October 14.